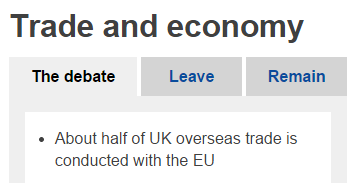 A small victory over BBC bias today - after reviewing a complaint I made last week they've decided that claiming that half of UK trade is conducted with the EU is incorrect and have changed the wording in the "Trade and economy" information box that accompanies articles on their website to clarify that it is nearly half of UK overseas trade. Around 8.5% of UK trade is with the EU, around 9% with the rest of the world and over 80% is trading with other people in the UK. When we leave the EU, this 80%+ of domestic trade will no longer need to be over-burdened with the red tape that spews out of Brussels.